Panelists discuss the power of youth voice with Sam Sanders (right) of NPR's It's Been a Minute. The week-long Youth Takeover of KQED News might be over, but youth voices are ready to inspire students in the Bay Area and beyond. Use this classroom guide to get started or visit the archive map or online collection and explore over 75 stories from a diverse group of student journalists. Stories touch on major issues such as cultural identity, immigration, homelessness and mental health. 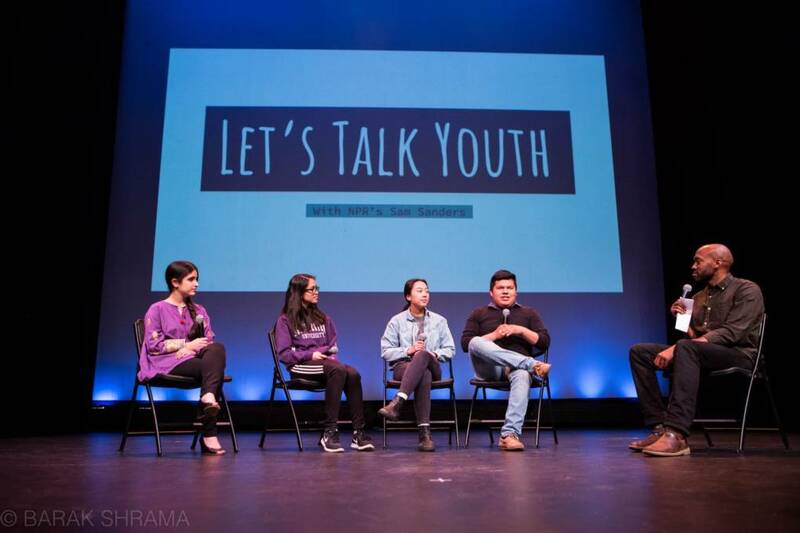 On April 27, some Youth Takeover journalists shared their work at a live showcase at the Brava Theater in San Francisco co-sponsored by NPR’s Generation Listen. An enthusiastic crowd gathered to hear stories and celebrate youth voices on KQED. Some students shared personal stories, like Joe Khorge from Sacred Heart Cathedral Preparatory in San Francisco who spoke about his experience with his sister, who has autism. Katia Bouali from El Cerrito High School talked about her decision to wear the hijab. Professional journalists joined student storytellers on stage. Sasha Khokha, host of The California Report Magazine, interviewed her Youth Takeover cohost, Tyrius Ammons, a senior at Richmond High School. Sam Sanders, from NPR’s It’s Been a Minute podcast moderated a discussion on the power of youth voice. Interested in learning more about storytelling and podcasting with your students? If you’re in the Bay Area, sign up for our summer blended course for teachers, The Sound of Learning: Podcasting in the Classroom.